kandeej.com: How To Color Your Hair At Home ~ Roots! Not everyone has the money to go get their hair colored in the salon right now, so im here to show you how to touch up your roots at home for cheap! This hair color how to, will work if you have outgrowth from your normal hair color, or you have grey roots that are not making you look like your youthful self! 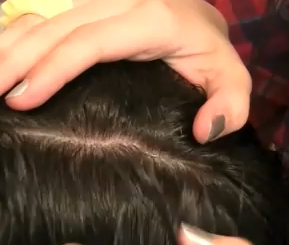 Here's how to touch up your roots at home, for cheap! creme developer (20 volume) - Maximum color deposit, especially for gray or white hair with lightening (grey hair is stubborn so it needs at least a 20 vol to hold the color) you can get this at the beauty supply store, or if you buy a hair color kit at the store it should come with developer! Now you just need some roots that need a touch-up and away we go! AFTER we dazzled her roots with hair color! 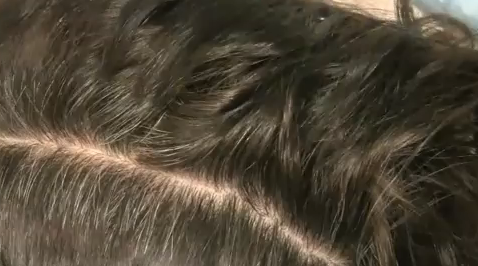 Now let's get ready to show you how to get super styled hair for super cheap at home! Save some money and buy something fun! 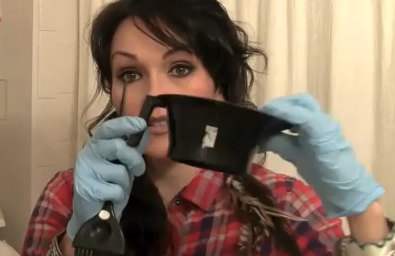 kandee, i miss your make up vids! your mom looks beautiful even with out make up. such a gorgeous family! Hello Kandee. Really thank you for the video. You know?two days ago I introduced you to my mum and although she doesnt know any English she adored you. She said that you are such a lovely person and wished you the best for your family. (she admired your wonderful smile) And now this video is like a gift to her because I dye her hair and of course in a much more worse way. So I think that she will appreciate this in a personal way. The country of sun and sea Greece sends you love and greetings. Hey Kandee!! Love your videos - i am a blonde - would i be able to color my hair the same way as you show in the video? I know dark colors hide mistakes better than blonds so am not sure thanks! I have friends who have done their hair like this forever and it saves tons of $$$. And I think we can all agree that we are trying to do EVERYTHING we can to save $$$ these days! Wow thats sooooo cool! Your so good at that Kandee!!! Thank you so much Kandee! You have saved this unemployed woman some cash and possibly helped my interviewing possibilities by showing me how to color the gray. I have only one small question: I'm a dark blonde and color my hair a tad lighter while also trying to cover gray. Is the process the same if you're going lighter? If you take vid requests, can I put one in to do the same thing you did for your mom but for a blonde? Kandee, I adore you and your videos!! I color my hair strawberry blond as that is what it was when I was little and I LOVED it. I have had a professional color my hair and it has not been the same as when I do it. Thanks for posting these hints and tricks for people like me who enjoy improving myself even if I don't want to pursue it as a career! Kandee - PLEASE do a tutorial on eye make up for light green eyes. Anything but plum :) Love your blogs - I learn so much from them! Kandee, this video was wonderful, per usual. I was wondering if you could do a hair tutorial on how to bleach your roots. My natural hair color is a dark brown, but I will soon be bleaching it out to white. I would love to know how to bleach my own roots, and avoid some expensive salon treatments. Much love to you and momma! Kandee thanks for sharing this was really helpful!! I love you!!!! WELL MAYBE! stylist shouldn't charge so much damn money in the first place that way we would consider not doing our hair our selves! I'm Glad Kandee shows us how to do this, I don't even need someone to do my make up or my hair, I even trimmed my own bangs the other day and they look so amazing! I did my daughters hair as well! huh! Then I washed blew dry it just like Kandee taught us to do! ;) thanks Kandee! you're awesome! Hi Kandee (i wrote this in your facebook last year and, as i'm not really sure you read it, here it's again)!! i have been willing to write you for a long time now, i just wish you get to read this (i've just listened to the story about a girl who you helped, and it hurt me to see you sad because you don't deserve to be treated like that ...). i started watching your videos last year, around the time you started making them, because i learned a lot, i had fun and since then i love them!! i remember that i felt pretty close to you when i watched the video in which you tell your story, and in your videos i found the courage i needed to change the things that i didn't like in my life, and i also became a makeup artist (i got my diploma last week, yay!!). although we don't personally know each other, i feel you are my friend, and i care deeply for you so, as you encouraged me, i want to encourage you this time: we need our happy-Kandee and her cupcake to be in good shape for us, so keep your head held high doll! I send you tons of love from Argentina!! please feel free to contact me, it would me an honor for me. PS. Cupcake is soooo cute!! Congrats!! I absolutely LOVE all of your posts. I am the QUEEN of DIY hair coloring. I am constantly doing my friends' hair, and I rarely get mine done professionally. It's cheaper with the box and relatively the same result! Great posts! This reminds me of my friends and I in High school dying each others hair. I myself haven't colored my hair in ages because I don't want to spend my money on it. Once I start getting gray hair I will. Your awesome. Hope your little one is doing great. My Sister is a hair dresser and beautician, she taught the trick of quick sectioning, great that you can share your knowledge with others, you are a wonderful inspration, continue being who you were created to be, and always do what you are led to do, not everyone can be pleased, but at least what you have to share can help at least someone :) oh yeah I wanted to ask just out of interest, I saw this advert it showed foam hair dye, have you, or would you ever use that? I don't dye my hair, but I just wanted to know if it really works? Kandee! Your amazing. I always learn so much from you. I also have found some great products due to your videos. I love the silver nail polish! Totally a great winter color. 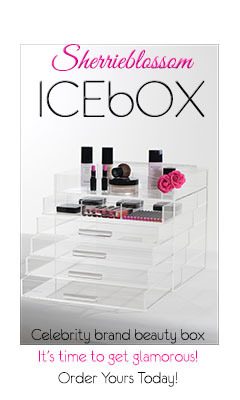 I know your busy, I hope you read this, but I was wondering if you could do another look by Urban Decay NAKED palette. For being kind, for each smile and for sharing what you know with us! Hi! I would love to know where you got your earings, they are amazing!